With its natural beauties, unique scenery and tourism alternatives, the monastery is popular every season and offers visitors different opportunities such as trekking, mountain biking, paragliding and a photo safari. In the monastery, the first part of which will be opened in the new tourism season on “May 18 Museums Week,” 4,000 tons of rocks were cleaned, a 300-meter walk way was maintained, historical aqueducts, the entrance building and the stairs were restored again. Speaking to state-run Anadolu Agency, Trabzon Provincial Culture and Tourism Director Ali Ayvazoğlu said that the Sümela Monastery drew great interest from local and foreign guests throughout the year. Ayvazoğlu said that restoration and landscaping works continued in the monastery since 2016 and the interest of people continued during the periods when it was closed. He said that the first stage of the restoration in the monastery and the environmental arrangement was finished and ready to welcome visitors. “In the first part, 4,000 tons of rock were cleaned to ensure the safety of our visitors. In addition, a 300-meter hiking path to the monastery was restructured, and the historic aqueducts, the entrance building and the stairs leading to the monastery were restored. We have now accelerated our works to clean the environment and prepared it for the opening,” he added. 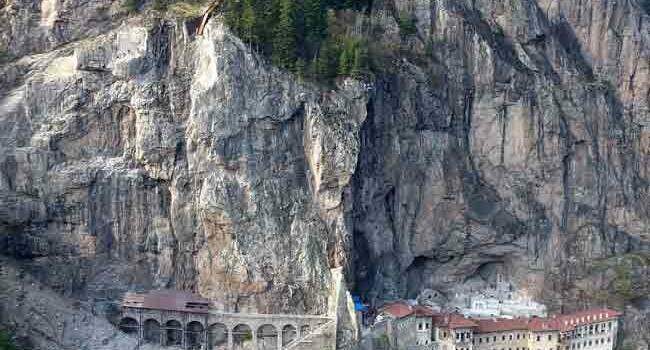 Sümela Monastery was closed in 2015 for a restoration process to dismantle danger caused by the rock masses around Karadağ Mountain. Restoration works have also been ongoing inside the historical monastery. It is a Greek Orthodox monastery and also has a very significant place in the history of art. It is believed that the monastery was constructed in the 4th century, although Alexios III (1349 – 1390) can be named as the real founder. It is inside the Altındere National Park and is surrounded by a beautiful forest. At the bottom of the mountain flows one of the arms of Değirmendere Creek. The vehicles can reach up to the parking lot at 950 meters height near the river, and from that point one needs to hike uphill through the path way approximately 1 km to reach the entrance of the monastery, which is located 1,200 meters above sea level.